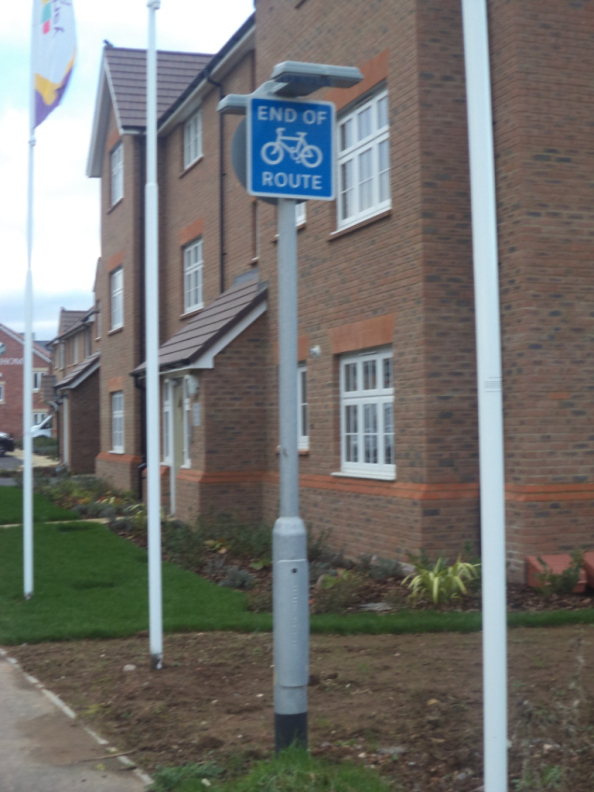 Considerable sums are being spent on providing new cycling infrastructure in new developments and road schemes. TACC welcome this and congratulate the County Council in working to achieve extensions to the local cycle network. However, we have strong concerns that this good work is undermined at critical points, particularly at junctions. We set out examples below. Limited crossings with long waiting times for pedestrians and cyclists. We recommend that SCC adopt now the guidance/design standards highlighted in the paragraph below used by many other highways authorities. 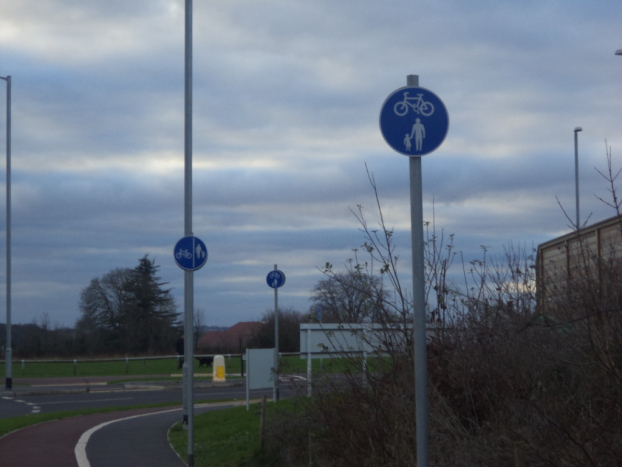 Use of these standards will reduce land take and costs and provide effective walking and cycling infrastructure. As a result a less traffic dominated environment will be created. All main roads in Taunton itself, excluding the Toneway/Victoria Parkway and the Obridge, should be governed by Manual for Streets 2 2010 (Mfs2) and all residential roads by Manual for Streets 2007 (Mfs). Both MfS documents need to be interpreted in accordance with London Cycling Design Standards and the Making Space for Cycling guide. The London Cycle Design Standards are considered to produce high quality cycle and pedestrian schemes which are increasing cycling and walking journeys as well as creating an overall better urban environment. We believe that Somerset County Council should use these for new and improved developments in the Garden Town of Taunton. The House of Lords Select Committee on National Policy for the Built Environment suggested in 2016 that the Government should make it mandatory for local authorities to follow Manual for Streets (and presumably MfS2 as well). DMRB (Design Manual for Roads and Bridges) is the design standard for trunk roads eg A358 to Ilminster but not in urban and semi urban areas. 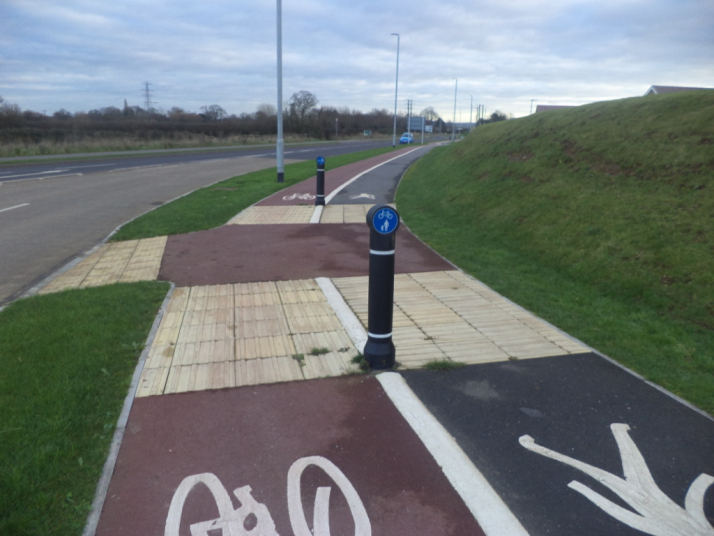 There is a new guidance note on cycling infrastructure for DMRB roads IAN195. SCC should be using this on trunk roads, including the J25 scheme, and any other roads where DMRB is being used as the design standard. Priory Bridge Road. Junction severing retail and jobs from housing. Pedestrians have to cross four lanes of traffic at each crossing point with no protection. Discourages walking and cycling in dense urban areas. Surely a junction of this size is too large for an urban context? Surely a safe and easy to use pedestrian crossing would be more civilised and safer? Imagine someone with walking difficulties trying to cross here when there are high traffic flows. Manual for Streets 2 9.6.7. says entry and exit widths should be as narrow as possible. 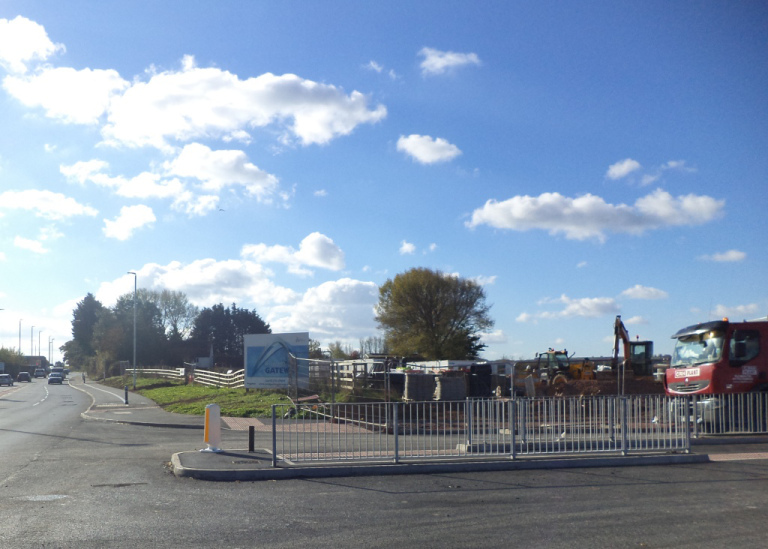 Similar approach at Monkton Heathfield, again creating barriers to walking/cycling. Do entries and exists into/from the junction need to be so wide taking into account para 9.6.7 in MfS2? 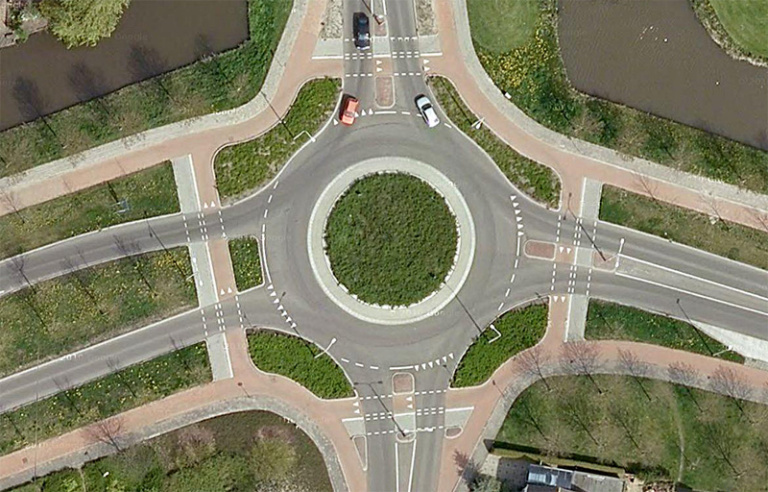 This roundabout layout is more equitable in providing for motor vehicles, pedestrians and cyclists. Crossing points positioned back from the problematical entries/exists and crossing much clearer to motorists. Crossing lengths reduced. 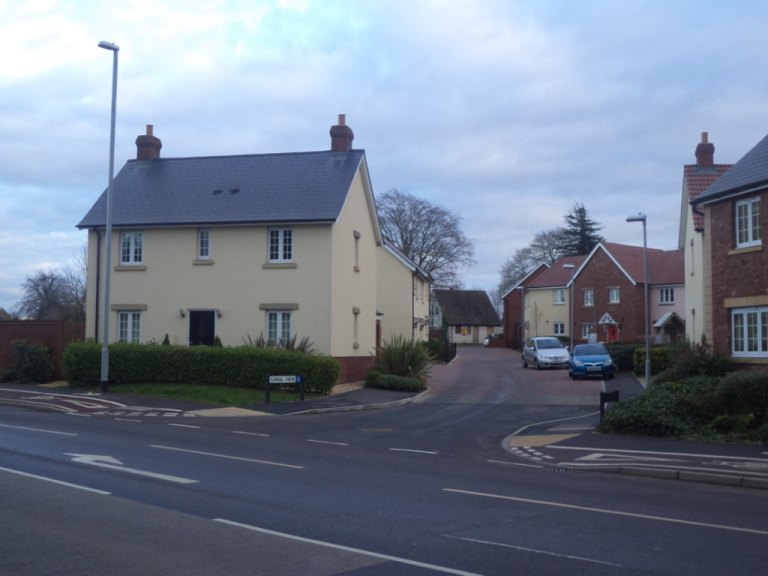 People walking and cycling have to defer to cars from a handful of houses on a route to school. Every time there is a side road, this problem is replicated. Sends a loud message about the priority accorded to people walking and cycling. MfS2 in 9.3.13 states that all crossings can be provided with raised crossing and a detail drawing is provided on page 100. 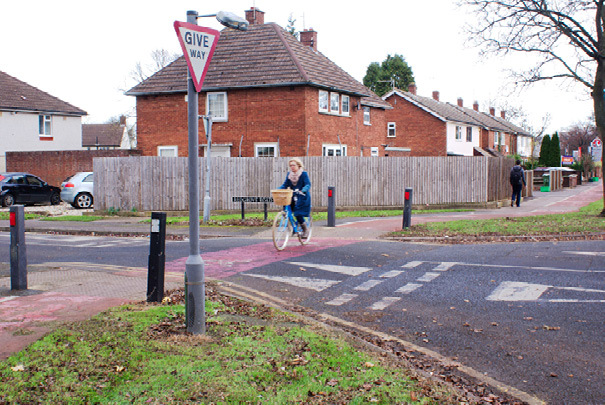 Raised crossings at side road crossings are becoming widespread in the UK (although not in Taunton) following MfS2 advice. Use of ugly guard railing and sheep pens to herd people was popular with highway engineers in the 1960s. Today many Highway Authorities minimise use of guard railing. This is a new Somerset scheme near North Petherton. However Dept for Transport LTN 2/09 advice is that alternative measures to guard railing should be considered. 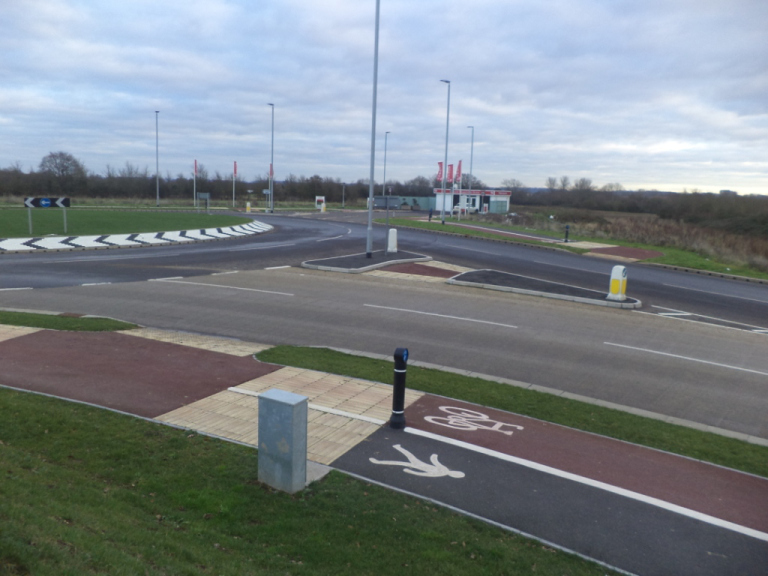 At the new roundabout at Chip Lane, cyclists are required to use a pedestrian crossing to negotiate a road junction – completely the wrong design solution on a road in an urban area. The junction should have been designed with traffic signals and cycle priority measures such as lanes, advanced stop lines etc. 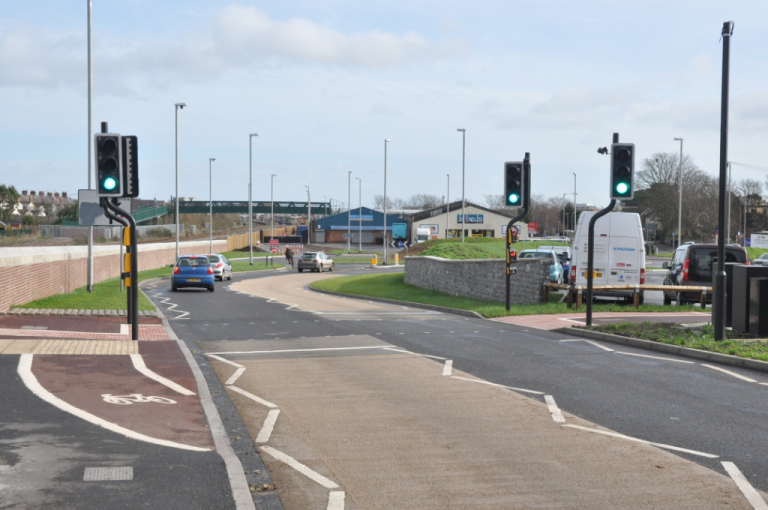 You can just make out a cyclist negotiating the roundabout – clearly cyclists are not going to use such an inconvenient arrangement, and will instead be at risk of being knocked off by traffic on the roundabout. Not very visible in dull/dark conditions and so constitute an obstacle. Their purpose is unclear. Often these aren’t properly installed and rattle as the user crosses them .Weeds can be seen growing through the gaps on this newish installation at Monkton Heathfield. Overtime, water ingress will create problems for users and from a maintenance point of view. Slabs of this type should be laid on straight lengths. 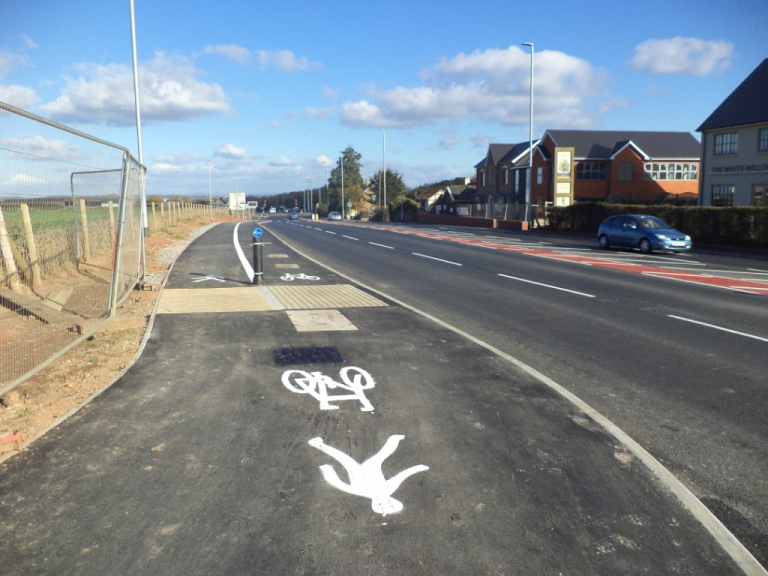 In some cases they are laid on slight bends and this creates a skid risk since they are laid with the lines running longitudinal on the cycling side. Is it really necessary to have mini forests of signs at a junction?